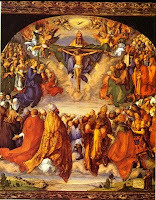 Today begins the Novena leading up to All Souls Day, which is celebrate on November 2. All Souls day is primarily a day in which Christians remember those who are faithfully departed who may already be in heaven and to pray for the holy souls of purgatory. O God, the Creater and Redeemer of all the faithful, grant to the souls of thy servants and handmaids departed, the remission of all their sins; that through pious supplications they may obtain the pardon they have always desired. Who livest and reignest with God the Father in the unity of the Holy Spirit, God, world without end. Amen.